Elliptic Curve Cryptography (ECC) is supported in cryptlib, both at the lower crypto-mechanism level and in high-level protocols like X.509, SSL/TLS, S/MIME, and SSH. cryptlib developers will now find it easy to integrate various ECC requirements into their software applications. Elliptic Curve Cryptography is an approach to public-key cryptography based on the algebraic structure of elliptic curves over finite fields. The US National Security Agency has endorsed it by including schemes based on ECC in its ‘Suite B’ set of recommended algorithms and allows their use for protecting information classified up to Top Secret. 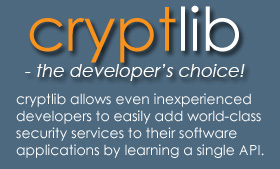 cryptlib’s implementation of ECC meets the requirements for NSA Suite B use.